The Code Cracker Case File is a folder which contains all the tools you will ever need to crack the English language. It has graphics showing all the components of Pam’s curriculum that are featured in the Code Cracker Curriculum. Usually, these components would be shown on pieces of paper, laminated posters, etc. Pam thought that these aids would be much more useful if they were found in the same place, and organized in a comprehensive way. She had managed to accomplish that, and so much more, with this folder. One of the best aspects of this folder is that it is not only compilation of Pam’s key aids, but it is also a convenient way to keep track of your child/student’s classwork. 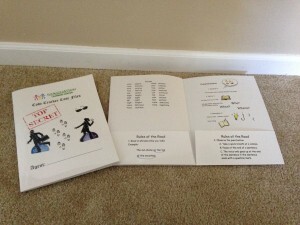 The folder features four sleeves that the child can slip their work into once they are done. The aids featured in the folder include: a complete list of the Solos, Duos, and Squads taught in Pam’s curriculum, the Stretch Write and Spell technique, the Rules of the Road, Pam’s custom Comprehension worksheet, and many more useful aids!